The first question is, “Do you like people?” Once you’ve cleared that hurdle, consider the following to determine whether human development might be a good major for you. Are you fascinated by seeing how people change over time? Do you wonder how families, schools, communities, and societies influence how individual personality traits, values, behaviors develop? Would you like to work with children, teens or older adults and learn how people change throughout these different ages and stages? At UC Davis, our human development major covers people from womb to tomb. We emphasize how biology and the environment affect how people change and develop from birth through adulthood. You will learn about a person’s social, emotional and cognitive development, all within the context of everyday lives, families and communities. 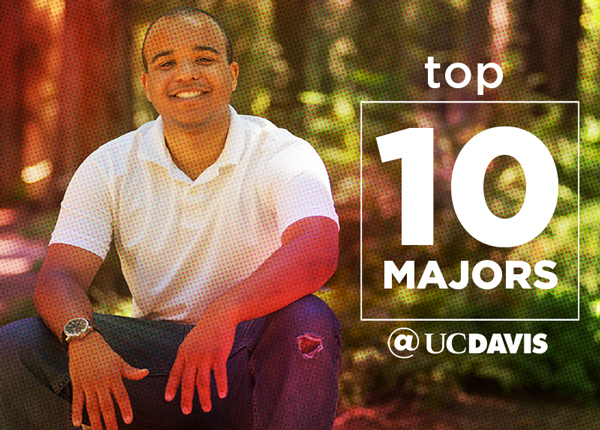 Human development is a popular major — one of the top 10 at UC Davis. Our human development majors take classes in biology, genetics, nutrition, statistics, psychology and more. The major is offered within the College of Agricultural and Environmental Sciences, and you will graduate with a Bachelor of Science degree. Our alumni work in a variety of fields including education, recreation and eldercare. Others pursue advanced degrees in health fields, counseling, teaching — or human development. Justin Nool ’14 is a recruiter for Yoh Healthcare, seeking medical professionals for case management, managed care and occupational health positions throughout the United States. He is also enrolled in a master’s degree program in health administration at George Washington University in Washington, D.C.
Amy Chan ’15 is doing graduate studies in speech-language pathology at San Jose State University. As a speech pathologist, she will assess and treat individuals with communications disorders. Tony Brusca ’88 earned a teaching credential from UC Davis and is a kindergarten teacher in West Sacramento. Purva Dandona ’01 participated in Teach for America for two years after graduation and then earned a master’s degree in counseling at Fordham University in New York. Dandona works as a recruiter for Goalbook, a Bay Area education company that develops software products that allow teachers to personalize and track goals and achievements for individual students. Megan Ha ’17 works with preschoolers as a classroom aide and intends to return to school for a master’s degree in teaching and an eventual career as a K-12 teacher. “The human development major is for people who think humans are equal parts strange and astounding. In fulfilling the major requirements, I’ve learned how neurons meet synapses to make humans feel love or anger; how women subversively shaped history in the American Revolution; how to detect signs of abuse in young children and how to help; and, most of all, that for every known fact about how humans work, there are countless questions still to be answered. For me, the big question is: How do human beings, having popped into existence in an established society, follow or push back against that society as it actively shapes us? “The major requires a practicum, in which you work in a related field and meet once a week in class to discuss what you learn. I intern in a kindergarten classroom, working one-on-one with at-risk students. This hands-on experience allows me to apply my classroom knowledge of early childhood development to actual children, who are wildly more variable and chaotic than their textbook descriptions. Theory has informed my practice, and I’ve become very comfortable in the classroom setting. “After graduation, I plan to work as a program leader in a nonprofit organization that focuses on community development. I may one day return to school for my teaching credential, and eventually I hope to work in education policy. “Majoring in human development let me pursue a holistic education that has better prepared me for working in the medical field. It also allowed me the time and flexibility to complete my pre-med requirements. “The human development major includes a practicum. For my practicum, I chose to work with the elderly in a local nursing home in Davis. I helped the staff with daily activities like bingo or group exercise for the residents, or sometimes I just spent time with the residents. This hands-on experience allowed me to apply what I learned in school. My practicum was eye-opening, impactful and, most importantly, fun! Visit our human development program web page to learn more. Robin DeRieux is a senior writer for the College of Agricultural and Environmental Sciences.